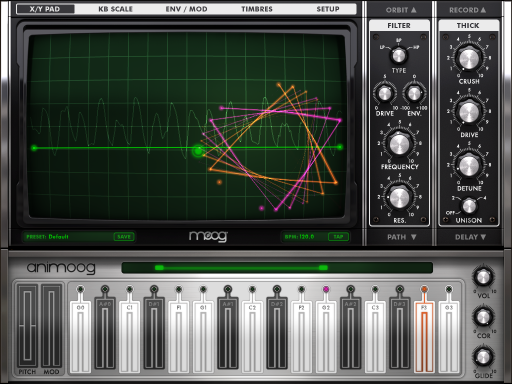 Animoog by Moog Music Inc. Review based on use with iPad 1,2,and (3) The New iPad. Also available for iPhone and iPod Touch. Moog Music has a long history of providing the world with amazing synthesizers with legendary sounds. 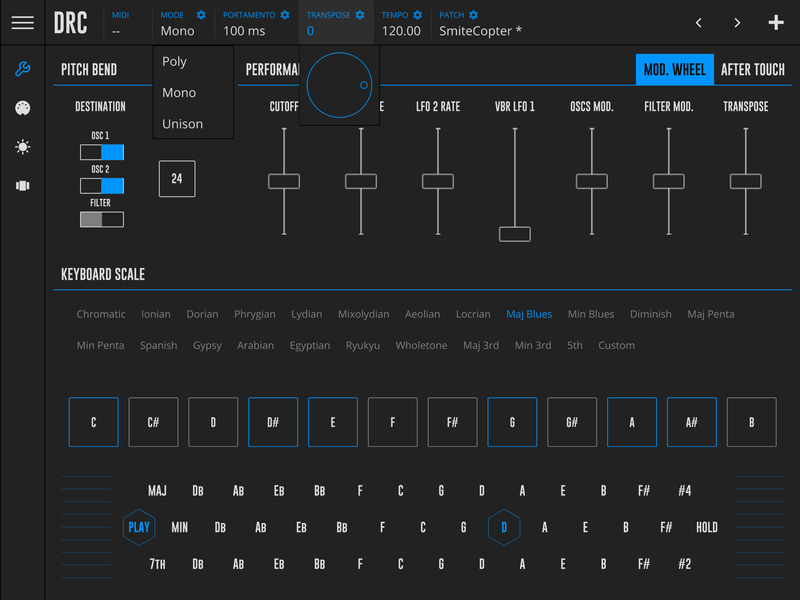 It should be no surprise that they would join the iOS music world by crafting a synth app that comes packed with their signature style on a new platform. 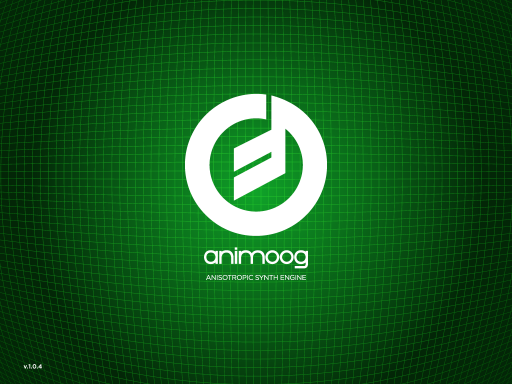 Moog Music developed Animoog with the modern touch interface well in mind. They cut no corners and delivered this stunning professional quality synth with their new ASE (Anisotropic Synth Engine) technology. 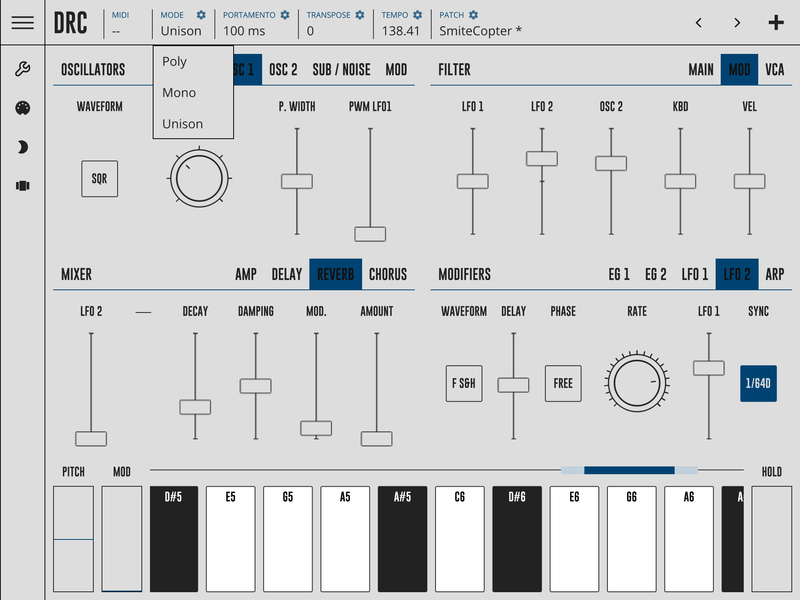 ASE in short allows the user to move through a sonic X/Y landscape full of unique timbres that respond, grow and morph with each touch on the X/Y panel. Animoog was a hit right off the bat. Loaded with timbres from analog waveforms “captured from classic Moog oscillators, both vintage and modern…”it was easy to feel the Moogness with the first touch of the virtual keyboard. This synth delivers fat, gooey sounds that are both audibly and visually marvelous. Complete with all the modules necessary to craft subtly evolving pads, to heavily modulated, bit crushed killer keys. Phat leads, pitch shifting blasts, ghostly FX, quiet and deep morphing bliss from all angles are well within or even outside the imagination depending on how one tweaks and manipulates each of the available tools. It also has the classic four pole Moog ladder filter with High, Low and Band Pass modes. Its tough to describe in words just how nice this synth is. It really must be heard (through decent speakers or headphones) to be fully enjoyed and appreciated. Click HERE to visit Moog Music web page for all the facts, links to buy, details and nitty gritty specs. Its all there, you’ll see. If you want to perform with it, go ahead its got MIDI capabilities and works great with any MIDI controller, or even a Moog Little Phatty. Using Animoog in my process is a snap since it has background audio, general paste board support to easily move recordings around various compatible apps all on my tablet. Layering with overdubbing is endlessly fun and useful. 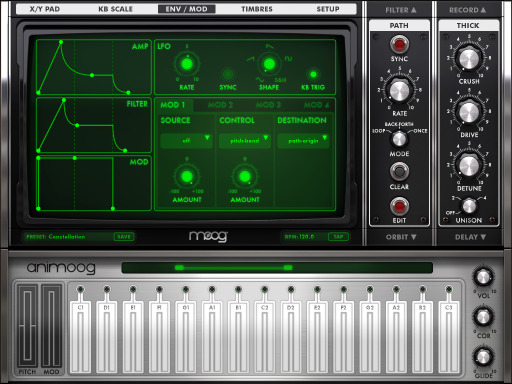 If for some reason you run out of ideas or just want more presets, expansion packs can add more Moogy madness sounds via IAP download. This is the real deal. 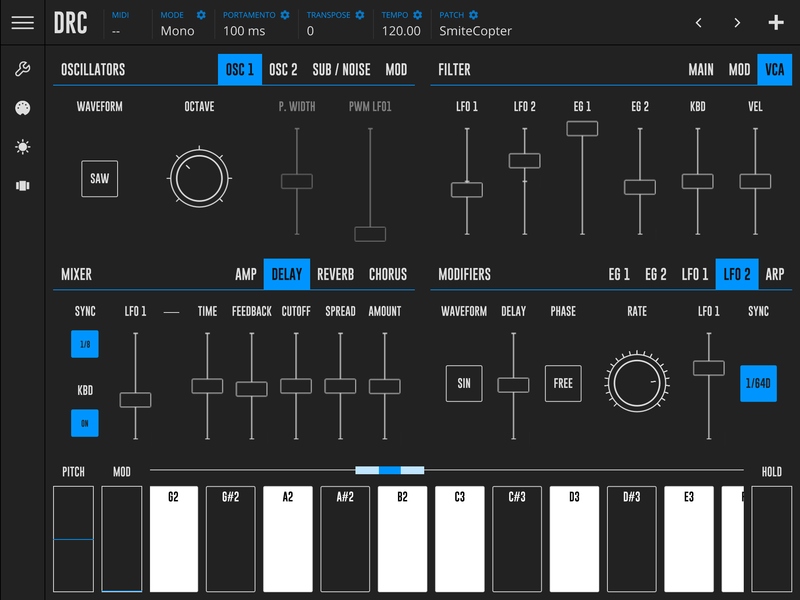 Something of similar physical or home computer soft synth design with these same capabilities would be far more expensive than this iOS version that brings the very same quality. I’m sure there is still some purist somewhere in his moms basement, hiding in his peanut butter fort, surrounded by racks of gear, miles of wires, and boards who will swear this is not possible. That would be a mistake. We have here another groundbreaking, indisputable example of how iOS music is for real. 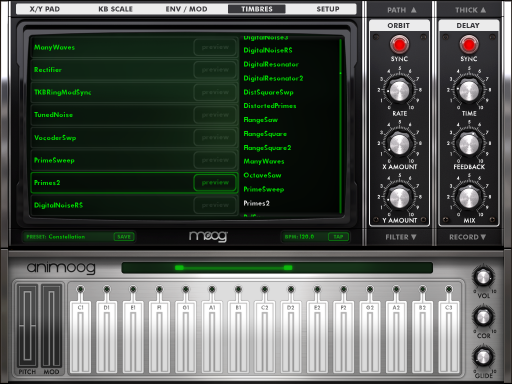 Animoog is a stellar synth and easily a big time must have for any iOS synth enthusiast, performer, and producer. My 2011 Music App Of The Year.